In the Northern hemisphere at any rate. I also think many of our friends down south are planning on a tropical adventure to get away from the cold. Either way it is time for parties, vacations, skimpy dresses and bikinis. I am the self proclaimed Queen of travel. My life revolves around adventures, work trips and catching up with friends and family. This year I will only spend about 6 months at home in Hong Kong. I will have about 4 months of adventures and 2 months of overseas based work. Right now I am writing to you from Port Douglas at the top end of the Great Barrier Reef in Australia. I am back in Australia for a couple of weeks – work, family and adventure. So what happens to the Venus body when travel and life gets in the way? Why, you take the the Venus Index plan with you. 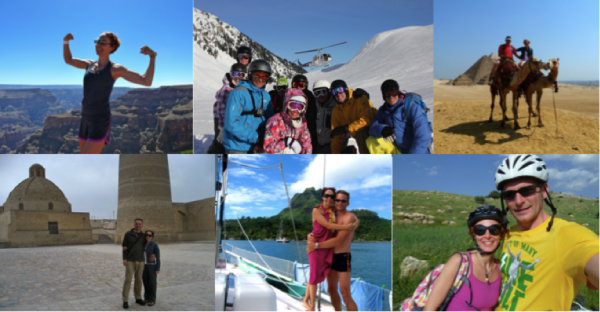 This is a snapshot of some of my fun adventures over the past year or so. On each one of these I took my Venus Index plan with me, I found a gym or I packed resistance bands. The funniest was when we were sailing around the South Pacific with my brother and Roly pulled the ab wheel out of his wheelie bag. Or maybe going to the gym in Egypt during the revolution last year. 1) Owning the Grand Canyon, USA. 2) Heli-skiing in Canada. 3) Camel riding through the Pyramids, Egypt. 4) Hiking the Silk Road, Central Asia. 5) Sailing the South Pacific, Bora Bora. 6) Mountain biking across Jordan, Middle East. Enough of my holiday pics for now. Here are some tips on how I keep my Every Day Venus look despite a hectic travel schedule. I think most of us want to look our best for vacation. Especially if bikinis and summery clothes are involved. I don’t do anything too special other than I lower calories a little and cut starchy carbs for about 2-3 days before leaving. Just gives a little more definition. I find there is no point doing full cut. It is too hard to maintain while travelling. Holidays are for fun not watching every mouthful. You can either time your holiday with a one week workout break, or just take Venus Index plan with you. I have pretty much always found a gym everywhere in the world. …And when I did not I took resistance bands. It may not be as good as your gym at home but it is enough. I find on longer holidays it is possible to lose upper body muscle (and lower if you do not move much). Roly lost inches from his shoulders while skiing this year by not keeping a little upper body exercise going. It may be due to my higher muscle maturity, it seem easier to keep muscles you have had for years than new built muscle, but it’s just a theory. I also walk a lot (or ski, ride or swim) on holidays. This burns calories. Just keep moving and it really does help balance out those bigger meals. For me travelling and holidays always means food. New things to taste, meals to socialise with friends and just relaxing the rules. I use the Anything Goes Diet philosophy to the maximum and if I am not hungry I will miss a meal. …but not by an insane amount. I eat enough to make me happy, just watching portions slightly and making some good choices. I also avoid those big grazing buffets. Especially the hotel breakfast ones. I never come back from holiday more than 2lb up. I also know the foods that bloat me. It is these I limit if I am going to wearing a bikini the next day. Don’t stress it, even if you eat a bit much and don’t workout. You know what to do when you get home to fix it. As a final thought this is me in Port Douglas today. At the gym practicing what I preach. Also on the beach. This is after a week eating 2000+ calories per day, when my RMR is about 1250 calories. Still an Every Day Venus. What about you? Do you have some special techniques you use on your holidays to stay bikini ready? Thanks Kimmets for these wonderful tips. I really appreciate how much you shared here and on the community. I used to think just starting to pack up the car for a trip was an excuse to start over eating. Now I get some of these simple tricks and it’s so nice to come home in the same shape I left and also not to make myself miserable and bloated the whole trip. Still learning! Kimberley, I love how you enjoy life, no excuses, and use the Anything Goes Diet and exercise wherever you want whenever you want. It’s just as designed and just beautiful. You are THE every day Venus!